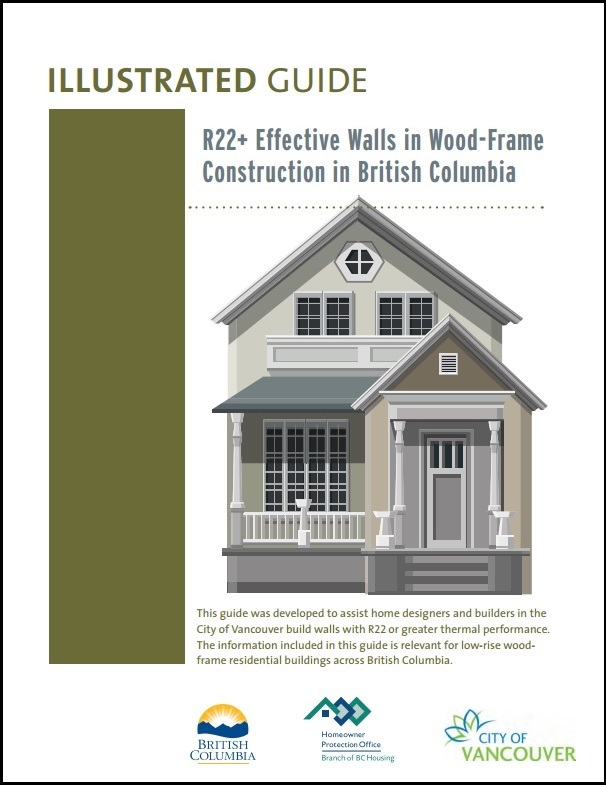 The Homeowners Protection Office (HPO) is pleased to announce that the Illustrated Guide – R22+ Effective Walls in Wood-Frame Construction in British Columbia is now available for free download from the HPO website. This guide was developed to assist home designers and builders in the City of Vancouver build walls with R22 or greater thermal performance. The information included in this document is relevant for low-rise wood-frame residential buildings across British Columbia. A valuable reference tool, the guide is intended to be an industry, utility, and government resource with respect to meeting this thermal performance level, while not compromising other aspects of building enclosure performance, including moisture management, air leakage, and durability. This guide was funded by the City of Vancouver and the Homeowner Protection Office (HPO), a branch of BC Housing, and was prepared by RDH Building Engineering Ltd. The AIBC contributed to the project by reviewing and commenting prior to publication. Additional resources from the HPO useful to architects are available.